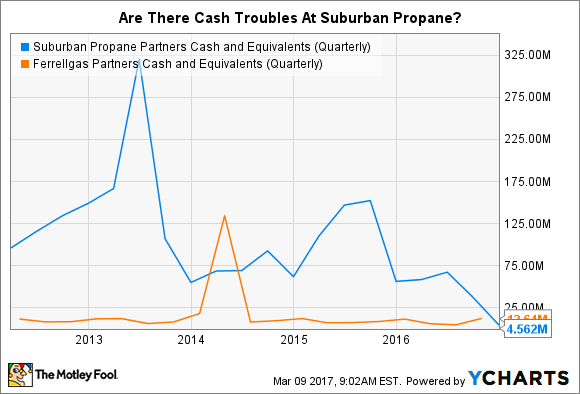 Ferrellgas is recovering from a bad investment, while Suburban Propane is muddling through tough times. This may be a case of bad news is good news. Ferrellgas Partners, L.P. (NYSE:FGP) cut its distribution last year -- not a good thing for income investors. Today it yields around 6.7%, lofty on an absolute basis but nowhere near Suburban Propane Partners' (NYSE:SPH) 14% distribution yield. There's a lot more to understand here, however, and in this case, the bad news from Ferrellgas might actually make it the safer investment option. When Ferrellgas reported full-year fiscal 2016 earnings, it also announced a few other things. For example, the company's CEO was out, with the chairman, founder, and former CEO James Ferrell taking over. The investments the departing CEO orchestrated in the midstream sector weren't working out and required an impairment charge of over $650 million, pushing unitholder equity deep into the red. Finally, the company announced that the distribution would likely be cut by more than 50%. The cut, announced at a later date, was actually a massive 80%. Complicating Ferrellgas' disastrous foray into the midstream space has been warm weather. The company's main business, and the main business of Suburban Propane, is delivering propane. Although propane has a wide array of uses, including backyard barbecues and crop drying, it's mainly put to work for heating. Unfortunately, the 2015 heating season was warm, and 2016 was even warmer. Suburban put some numbers on that in its fiscal 2016 annual report, explaining that 2015 was 2% warmer than normal and 2016 was a huge 17% warmer. Since demand for heating goes up and down with the weather, it's not surprising that volumes sold at Suburban and Ferrellgas fell sharply during the 2016 heating season. They get paid to deliver propane, so their top and bottom lines took notable hits as well. Ferrellgas has clearly been forced to hit the reset button. It's focusing on paying down debt and working back from its painful investment in the midstream sector. For the most part, investors have seen the impact. Suburban, on the other hand, has been able to muddle through and hold the line on its distribution, something it considers very important. But cash is starting to get a little tight. Despite the fact that better weather patterns (for propane distributors) helped push adjusted EBITDA up 25% year over year in the fiscal first quarter, cash on the balance sheet fell to just $4.5 million, from $37 million just three months earlier. And the partnership had over $150 million in cash at the end of fiscal 2015. SPH Cash and Equivalents (Quarterly) data by YCharts. That makes the roughly $215 million the partnership pays out in distributions annually look pretty expensive. As the drop in cash might indicate, it paid out more in distributions than its operations provided in fiscal 2016 and it dipped into its bank account to make up the difference. The same thing happened again in the fiscal first quarter. So it looks like the high yield is a function of concerned investors pushing the unit price down in anticipation of a distribution cut. This isn't to suggest that Ferrellgas isn't suffering under the same difficult weather patterns that are impacting Suburban Propane. It is and cash is tight, too. But Ferrellgas' cash balance has more than doubled since the end of July 2016 (to around $14 million) as it works to revamp its balance sheet. And, because it has already taken the drastic step of cutting its distribution, Ferrellgas appears to be more capable of maintaining the distribution it currently pays than Suburban Propane, which hasn't cut (at least not yet). And that, in my eyes, makes Ferrellgas a far less risky option for income investors relying on their distributions.